One agency has developed a structured approach to creating augmented reality and virtual reality experiences for clients and encourages other agencies to adopt the same strategy. The ‘VR Content Pyramid’ was a central component in a presentation by Isobar’s Leigh Christie at the AR In Action summit, a two-day event that just concluded at MIT. 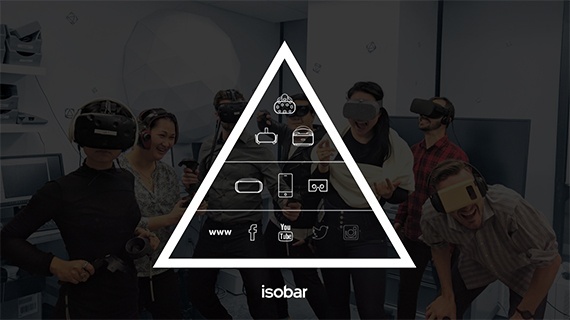 Isobar’s approach to VR and AR content creation is to start at the top with the most immersive and interactive experiences possible and then adapt that same content to the lower tiers. Although creating for experiences within Tier 1 is much more expensive up front, scaling the content to the lower tiers is a more effective strategy than starting at the bottom, according to Christie, who manages the agency’s NowLab innovation labs in the Americas. “If you build content at the top and work your way down that pyramid, you can kind of democratize your content, get a lot more eyeballs and a lot more people paying attention to what you’re doing,” Christie said. “Go for the best possible thing, even if it’s way too expensive and totally unaffordable. Then you work your way down the pyramid towards things like Oculus Rift, Sony PlayStation VR, Daydream, Google Tango and other mobile-based experiences, and then into your billions of users, which is Facebook, YouTube, Twitter, etc.,” he said. Isobar has worked on multiple 360-degree video projects for clients, but the focus moving forward is on room-scale immersive VR on systems like HTC’s Vive, according to Christie. “360 video is fun, but no one cares. After you get the full, 3D, immersive experience of room-scale VR, this stuff is just boring,” Christie said. However, the general approach from clients unfamiliar with the different levels of VR and AR has been to start at the bottom with 360-degree videos. “Up until that pyramid, they had no idea what to do. They were all going after 360 video because it’s cheap and it scales. They couldn’t understand the value in going after high resolution and high polycount,” Christie said. The demand for VR and AR is coming from the client side, although the ask can be misguided at times, according to Christie. “We talk to other experts and then we go back to the client and say ‘here’s what we think we can do that’s really expensive, here’s what we think we can do that’s affordable,’” Christie said.